After graduating from college I discovered just how much I had to learn. Each year I realize that there’s even more things for me to discover. Then I read a letter like this one from Louie and I have to remember how much I do know, and how little everybody else knows about my dad, Louie. When I read his letter, this one or any of the others, there is a wealth of background only a select few people know about. I hope to my little commentary to each letter to help you understand the depth of Louie’s life. Judy, the kids, and I joined Louie at the reunion he discusses in this letter. We were lucky enough to get there in time to go over to the old house with him and snap this picture. He was a giddy old man when we were at the house. I can see it in his eyes. He not only told the story in this letter, he told it at the reunion several times, and re-lived it several times with the family. One of the things you probably don’t know is that Louie’s next older brother’s name: Bob. When Louie tells Bob about his new pocket knife, I know it was a really big deal. In a later letter you will read about the awe Louie held Bob in, almost to the point of costing Louie his life. 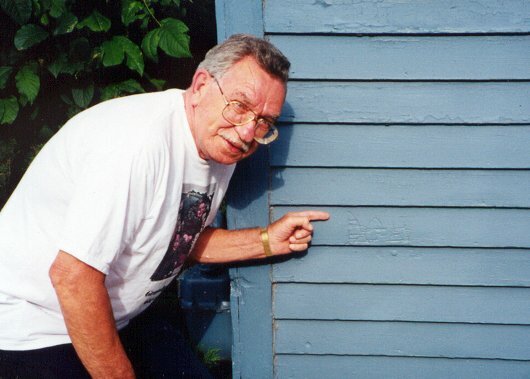 In person Louie expanded on the story a little, explaining why the initials on the side of the house weren’t his name (Donald), and weren’t exactly his initials (DLH). While he went by the name Louie from high school on, his given and childhood name was Don. That’s what he started carving into the siding. At that point he didn’t know how difficult it was to carve letters into wood. So after a couple of letters (D and O), he changed the plan from his name to his initials. He didn’t have the words to describe it then, but I suspect there was a little ADHD going on that encouraged a shortened signature. Too bad he didn’t make the change soon enough to get the letters right. As I recall, there was a punishment involved after his dad, Louis, discovered the carving. I smile now when the thought crosses my mind, but the details escape my memory. Some years after Louie’s funeral we stopped by the house again to get a better picture of the DOH, but the house had been re-sided by then. I guess that’s understandable after sixty years of North Dakota weather. Reading these stories and thinking about my Dad Louie makes my day. On the Fourth of July weekend of 1991 I was in Jamestown, North Dakota to attend a reunion of our 1946 high school graduation class. It had been 45 years since I graduated and sure looked forward to seeing some of those (kids), now older folks. I had some time to spare when I got to Jamestown so I went down to the west end of town, my old stomping ground and looked around. Found the “Tin Can Alley” where my folks’ house still stood. It had been redecorated on the inside but the outside was still like it was 60 years earlier. The one thing I look for or some hand cut initials on the side of the house. One of the first things I did with it, besides almost cutting off a finger, was to carve my initials in the side of the house. When I was there in 1991, I found them still on the side of the house covered with many coats of paint, but still there. Funny thing about this one is instead of carving “DON,” I had neatly carved “DOH.” After 57 years they were still there. Kinda had a little tear in my eye when I seen that. Kind of makes your day, eh?